When it comes to farming, major problems can come in small packages. Last year, the tiny silverleaf whitefly decimated vulnerable crops throughout south Georgia, ruining nearly 80 percent of the state’s snap beans and 30 to 50 percent of its squash and cucumbers. By one estimate, the whitefly problem cost farmers $80 million to $100 million over the course of the 2016 and 2017 fall seasons. The silver whitefly, which can be as small as 1/12-inch (about the thickness of a dime), actually isn’t a fly at all. This invasive species is related to aphids and mealy bugs. Their destructive power begins when they cluster on the undersides of crop leaves. That’s where they lay eggs and feast on plant sap. As their population grows, they weaken their hosts and leave behind debilitating diseases. Left unchecked, whiteflies threaten to wreak havoc on the profitability of the state’s top industry—agriculture. 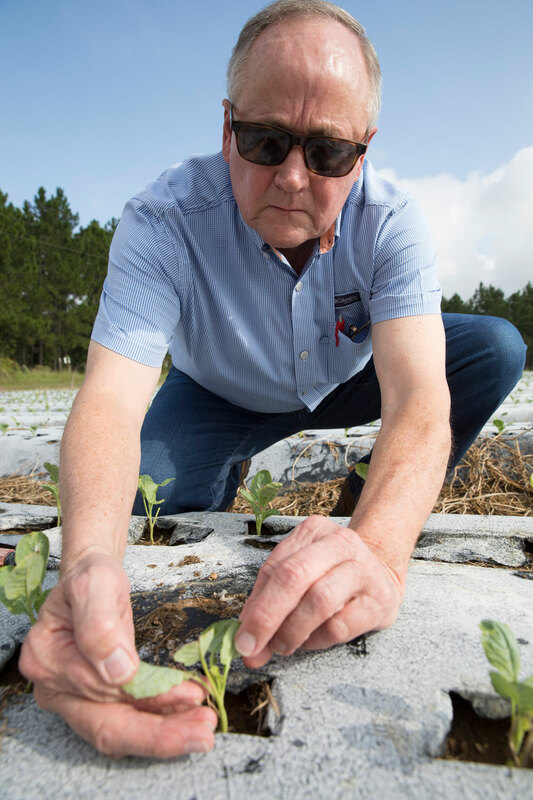 Tifton County farmer Bill Brim was one of the producers hit hard by the pest. Most of the squash crop was ruined at Brim’s Lewis Taylor Farms, an 80-year-old family-run farm. His crews packed only 88,000 boxes of squash compared to the more than 380,000 they’d done two years before. It was a devasting financial blow. Over the years, Brim has worked closely with the University of Georgia and Cooperative Extension agents to manage similar threats to his crops and the farm’s bottom line. Now, he and other farmers are counting on the university to provide new solutions to minimize the whitefly problem. Determined to prevent another devastating season, UGA formed a team of researchers and Cooperative Extension specialists to tackle the challenge. The team, which includes entomologists, horticulturists, and plant pathologists with the College of Agricultural and Environmental Sciences, is attacking the threat on multiple fronts. 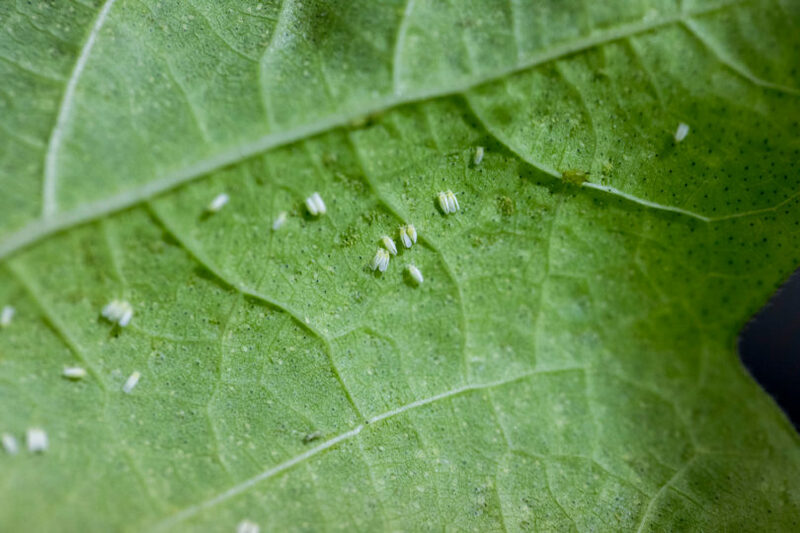 While some are tracking whitefly populations to determine the pests’ ideal environment, others are helping farmers mitigate the damage infestations will have to their crops. Whitefly infestations are tough to manage, even with pesticides, as Brim can attest. That’s because whiteflies have a prolific reproductive cycle. A female can lay between 150 and 200 eggs over the course of its weeks-long lifespan. And it only takes those offspring two to four weeks to mature into adults and begin reproducing themselves. So, when a population takes hold, even pesticides can’t always eliminate the problem. The key is preventing an infestation in the first place. To stop the next mass infestation, researchers have to understand what conditions are rife for whitefly propagation. That, it turns out, requires a lot of driving. Apurba Barman, a postdoctoral researcher, and other colleagues cover 800 miles of roadway each week. They are counting the whiteflies caught in traps set up every 5 miles from Dothan, Alabama, to Vidalia, Georgia, to learn where populations are growing. They compare population data in an area with environmental factors, such as crop configurations. Barman and entomology professor Michael Toews are particularly interested in whether growing certain crops—especially whitefly-preferred hosts like squash and cotton—near each other is compounding the problem. Ultimately, they hope their findings will inform new strategies for crop configurations to make fields as inhospitable as possible to the bugs. While Toews and Barman track the insects’ population, other UGA scientists are looking to lessen the bugs’ impact. Vegetable pathologist Bhabesh Dutta and vegetable specialist Tim Coolong are working to help producers find varieties of squash, snap beans, and zucchini that are less susceptible to whitefly-transmitted diseases. Babu Srinivasan, an entomologist, is studying long-term management of whiteflies. His research at UGA’s Tifton and Griffin campuses focuses on identifying weak links in the virus transmission cycle and developing strategies for efficiently dealing with both whiteflies and the viruses they spread. Compared to last year, 2018 doesn’t look so bad. Freezing temperatures in January 2018 killed some of the weeds that host whiteflies and allow them to survive from one season to the next. The bad news is that whiteflies are here to stay. Georgia farmers can expect to encounter them every year, Toews says, but the severity each season will vary. That perfect storm of conditions made for a devastating season. UGA researchers are determined to not let history repeat itself. With the stakes so high—both for individual farmers like Brim and the Georgia economy as a whole—UGA researchers won’t quit until the silver whitefly is under control.